Its funny what sticks in your mind as a child, but I can easily remember a large shaggy dog who sunned himself by the porch of the Cochran House, seemingly oblivious to the press of time and traffic. It seems nearly everyone who has lived in and around town carries some fond remembrance or personal association with that convivial institution which stood at the business center of Sussex County. My great-grandfather, (John) Edward Brink, was the carpenter hired to install the much-admired Log Cabin Dining Room (or "Slab Room as he called it) back in 1925. A generation later, my mother worked a summer job as waitress there, while attending New Jersey College for Women. She met and dated my father and well, as they say, the rest is history. ran House. We halted at the corner of the Green in the budding shade of a tall elm, where my grandfather joined several of his friends and contemporaries. Wide-eyed, I watched the dusty work of demolition for some time before I noticed a profound silence in my immediate circle. Turning and looking up, I saw in the stricken faces of those old-timers a sense of loss as deep-seated as any occasioned by the death of a close friend or relation. Grandpa remarked how Newton had changed more in the past five years than it had in all the previous years of his life  somehow, I didnt think he meant it had changed for the better. When I turned back to the crumbling hotel, I felt that a terrible mistake had been made, that something more than bricks and mortar had come undone. That a beautiful facsimile of the Cochran House should arise on the urban renewal tract opposite the Court House some thirty years alter the demise of the original is testimony to a stubborn affection for this emblem of a lost way of life. It also certifies that our landmarks are more than the sum of their parts, however plainly or fashionably arranged those parts may be. 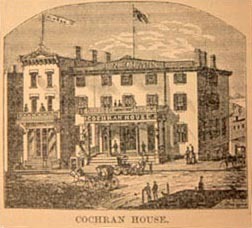 The Cochran House was a source of pride, a dispenser of hospitality. There are innumerable stories of Newtonians being confronted at some distance from home by strangers who asked about the Cochran House, its blueberry muffins or its pumpkin custard pie. Historically, that brick hotel at the foot of Main-Street was scene to festive, political and social gatherings for 160 years. Standing at the very heart of the community, it had been a social oasis for generations of townsfolk, travelers and summer visitors. Here, as best I can tell it, is its history. But it is more than the story of a lost landmark because the origin, expansion, and demise of this hotel disclose strong , sub-currents in the general history of our community. The earliest record of an inn standing at the confluence of Spring and Main Streets is found in a bar book, kept by Pettit Brittin, beginning with October l807. Basset, Brittin & Hinchman opened regular mail-stage communication between Newton and New York City on August 15, 1808. They paid three tolls (12-1/2¢ each) to travel the Morris Turnpike between Newton and Elizabeth. Pettit Brittin opened a stage hotel to accommodate his traveling clientele. A tavern on the site of the Cochran House, managed by Matthias Little, was purchased by Charles Pemberton, merchant and postmaster, from John Gustin on March 5, 1813. Pemberton leased the hotel to Samuel Lane for an annual rent of $80, but sold it only three weeks later to John Rorbach for $2,100. It was operated by Mark Luce in January 1815 when John Rorbach again advertised it for sale or rent. At this time, Zephaniah Luce and James Hanna operated the Sussex & Morris Mail Stage which departed weekly for New York from Mark Luces tavern. The trip, including overnight lodging at Morristown, cost $3.00. On January 6, 1816, John H. Hall, proprietor of the Sussex Register, took Luces place as tavernkeeper. On March 11, 1816, John Rorbach, then a dry-goods merchant on Pearl Street, New York, sold the Tavern Lot to Isaac Basset for $3,000. In September of that year, the firm of Luce & Hanna, stage proprietors, dissolved when Mr. Hanna absconded with the receipts. Mr. Basset was proprietor until November 6, 1817, when he sold to Frederick Ransier, a grocer, for $2,100. Nathan Drake purchased the tavern on March 23, 1818, and continued as its proprietor until 1831 when the hotel passed to an Irishman named Dennis Cochran. Dennis Cochran was born in Manor Hamilton, County Leitrim, Ireland, on March 5, 1800. As a young boy he went to the city of Sligo and learned the butchers trade, then embarked for New York City in 1818. While contractors were building the Morris Canal through Waterloo and Stanhope in 1827, Dennis Cochran sold meat in the shanty camps of Irish laborers who were engaged in the digging. Prospering at the butchers trade, Cochran settled in Newton where he married Lydia Hunt on May 7, 1831. By this date, he had assumed management of Drakes Tavern. A steady increase in trade and travel, to and through Newton, urged construction of better public accommodations. In 1843, Dennis Cochran vacated his old stand at the southeast corner of the Green, then known as The Newton Hotel and Stage House, while a new brick hotel was being built according to plans devised by Amos A. Harrison. Dennis Cochran completed a new store building adjoining the hotel that was immediately occupied by Mrs. Canfield and Mrs. Medaugh as a millinery in April 1855. The arrival of the Sussex Railroad to Newton brought a great increase in travel and trade. After a quarter century of personal management, Mr. Cochran retired, leasing his hotel to Horatio N. Sherwood and John F. Conger in March 1856. On February 22, 1859, Newman E. Benjamin purchased the famous hotel for $28,000. The following month, Mr. Benjamin also purchased the lease of Conger & Sherwood and assumed management. On March 24, 1860, a Young Mens Republican Club was organized at the Cochran House with Martin Havens, president. On November 8, 1860, Republicans gathered here for a jubilee supper to celebrate Abe Lincolns election. The Newton Comet Band and Emmans Martial Band of Lafayette furnished music. Wide Awakes from Newton and Johnsonburg marched in torch-light parade. Colonel Samuel Fowler ignited a gathering of 200 prominent local Democrats at the Cochran House on February 4, 1861, when he declared his readiness to fight Secession and restore the Union. His sentiments were not universally shared, however, and on March 4, 1860 the day of Lincolns inauguration a rebel flag was seen floating above the Clerks office on the Newton Green. After considerable frustration finding a tall ladder, the enemy banner was retrieved by Moses McCollum and torn to shreds. Jacob D. Konkle, having leased this well-known and popular Hotel, provides us our earliest description of the interior of the Cochran House in May 1860. He wrote: The House contains sixty-three rooms capable of accommodating 125 to 150 guests. The Parlor, extending the full length of the main building, is 48 feet deep, and can be divided into three separate Parlors, by folding doors, thus giving the advantage of three separate rooms, for the accommodation of different guests who require them at the same time. The Dining Room, built expressly for the purpose, is 70 feet long, with windows on both sides. It could serve 125 persons at each meal. The Reading Room and Bar Room occupied the entire length of the south-east end of the building. Austin Predmore, an expert bartender, offered choice Liquors, Wines, Cigars, &c. at the Bar. In the rear of the Bar Room, newspapers from different sections of the State, together with New York daily papers, were available in the Reading Room. A Brick Stable, erected this past season, 10 feet long and 30 feet wide, sheltered horses and carriages. There was also a frame stable, 60 feet long and 36 feet wide. In all, 130 to 150 horses could be conveniently stabled. In 1861, Dennis Cochran bought back the popular hotel at Sheriffs sale. On March 8, 1862, Jacob Konkle sold his hotel furniture and departed to manage the City Hotel in Newark. He was succeeded by former lessees, John Conger & Horatio Sherwood, on April first. On November 15, 1864, Conger & Sherwood dissolved their partnership and Reuben Hayne, photographer, assumed Mr. Congers place in the firm. On that same date 150 Union men sat down to a banquet to celebrate Lincolns re-election. Henry M. Ward, the new lessee, made numerous improvements in April 1870. Evidently pleased with his success, Ward leased the Cochran House for another five years in July 1871. In December 1871, Ward & Kelsey placed in front of their hotel a handsome house for the residence of the large flock of sparrows who live about it. A Centennial tree was planted at the south corner of the hotel in May 1876. In 1879, ownership passed from Dennis Cochran to his son, Lewis Cochran, and to his son-in-law, Robert A. Sheppard. In 1880, Lewis Cochran sold his half-interest to Robert Sheppard. Dennis Cochran died February 20, 1880, aged 80 years. Despite marrying at the age of thirty-one, he had fathered eleven children, eight of whom were living at the time of his death. John N. Clark took over as hotel manager on April 1, 1879. He engaged workmen to enlarge the bar room and to remodel the reading room. The kitchen was changed to rooms directly under the dining room. Building an interior stairway, he remodeled a room under the reading room in July 1879 and outfitted it as a billiard parlor with two new tables of the latest design. John Clark renewed his lease in February 1885. In March 1889, John Clark advertised the sale of his hotel furnishings, handing over management to I. B. Case, of Brooklyn, on April first. In May 1889, the Cochran House was covered with iron roofing, a new type of covering that combined the advantages of cheapness and durability. New stables for the Cochran House were also completed at this time. 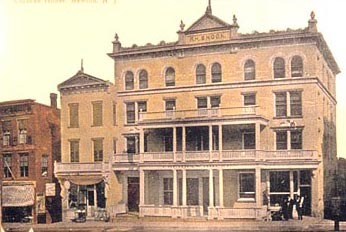 In February 1890, Mr. Case leased the Clarendon Hotel in Hackettstown and, on April 1, 1890, Edward Decker, formerly at the Orange Hotel in Goshen, New York, took over management. In April 1892, H. D. Couse, jeweler, occupied the store room at the Cochran House recently vacated by Cyrus Foster, bookseller. Robert H. Snook, proprietor of the Sussex Hotel, purchased the Cochran House from the estate of Robert A. Sheppard on December 9, 1895, for $21,500. He embarked upon $15,000 in renovations including construction of an additional story to the building, transferring the existing barroom to the room occupied as a sitting room, then remodeling the old barroom into a general office and lobby. The parlors were converted into a general reading and reception room while rooms above were devoted to a parlor for ladies and guests. The whole front was to give place to an exterior of more attractive and modern design. He introduced public water and electricity, including a system of electric bells. On April 1, 1896, Mr. Snook assumed charge and employed Simeon S. Cook, master builder, to design and supervise his plan of extensive renovations and enlargement. By July 1896, carpenters were at work changing the front of the building which, after extensive remodeling, was then painted a light color. In June 1897, Robert Snook completed arrangements for placing the bar in the basement. 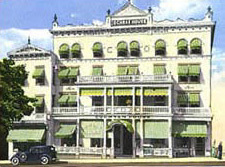 The building, now four stories in height, contained 24 rooms outfitted with new furniture, hot water, bath tubs and lighted throughout with gas and electricity. He installed plate-glass windows in the reading room on the first floor to provide a view of the streets and County Green. This reading room had quartered oak trim and mural decorations. An Office and Samples Room (designed for use of commercial travelers and as a place of quiet retirement for guests) was located behind the reading room. The porch was raised and enclosed by a substantial railing. Brose Woodward presided at the basement bar. There were also pool and billiard rooms, lavatories, and smoking rooms on the lower level. A new coach made by A. B. Koyt was driven by George Price. Finally, in August 1896, a pedimented iron cornice with ornamental urns was placed atop the front of the building. In January 1902, David Marshall opened a hotel barber shop. In March 1904, Robert Snook employed carpenter Charles Glesner and masons ODonnell & McManiman to lower the first floor of the building and to build a brick addition, 30 feet by 80 feet, three stories over a basement. By this enlargement, the dining room was increased to 30 by 60 feet with ample room for kitchen and pantry. In July 1904, Martin Fitzgerald installed a steam heating plant. On December 12, 1904, Robert Snook reopened the Cochran House after completing alterations that enlarged its capacity to forty-four sleeping rooms with a larger dining room, kitchen and pantry. The office was finished in oak. The barroom was refurbished with fancy wood and glass work, a metal ceiling and tile floor. He planned further improvements to the restaurant and billiard parlor. Workers laid 350 yards of linoleum on the first floor in December 1912. American Legion Post #86, named for Lt. Charles A. Meyer, was organized at the Cochran House in August 1919. That December, the Newton Vigilant Society held a meeting there to discuss the advisability of having autos come under the protection of a society formed to cover horse-stealing. In October 1920, Charles Wright, proprietor of the hot dog and lemonade stand at the corner of the Park, leased the lunch room and bar of the Cochran House. In April 1922, Charles F. Hendershot became proprietor of the Cochran House, making extensive improvements to the landmark hotel. On June 14, 1923, the Newton Rotary Club was chartered at the Cochran House and Herbert Bentley elected its first president. On July 25, 1925, Charles Hendershot introduced his new log cabin dining room, hosting the annual dinner of an association of newspapermen called the Pica Club. 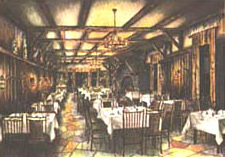 This new facility, described as one of the most unique dining rooms in the State, was furnished with all the details of a complete log cabin, including a fourteen-foot fireplace and a seating capacity of 125, thus giving this famous hotel with the regular dining room in operation a complete capacity for 250 people. Charles Oakely, of Elizabeth, an architect specializing in restaurant design, drew the architectural plans. Contractor Reuben W. Lambert of Newton supervised the work, employing J. Edward Brink and Russell Brink to do carpentry and slabwork. Adin Van Sickle of Sandyston built the stone fireplace and chimney. On May 1, 1930, Mrs. Charles Hendershot held the first Octogenarian Dinner at the Cochran House, which thereafter became an annual event. The idea occurred when Watson Ayers of Andover told Charles Hendershot that there were at least 125 men in Sussex County over 80 years old. Mr. Ayers became first president of the Octogenarian Club. In July 1930, Charles Hendershot employed contractor R.W. Lambert to build a new kitchen for his hotel and to transform the old kitchen into a new dining room. On Thanksgiving Day 1932, the office of Western Union Telegraph Company was transferred to the Cochran House. Contractor William I. Houghton remodeled the hotel lobby in December 1934. Charles F. Hendershot, proprietor of the Cochran House for seventeen years, died October 6, 1939. Title to the premises passed to his stepson, George Hendershot, on July 19, 1944. When John Coats moved his jewelry business to 103 Spring Street in 1950, a Coffee Shop opened at his former location in the Cochran House store. On November 22, 1960, the New Jersey Herald announced that Mr. and Mrs. George Hendershot had sold the Cochran House to J. J. Newberry Company for $225,000. The Cochran House closed its doors on Saturday night, March 23, 1961. In April 1961, it was razed for construction of a $500,000 junior department store. The basement area of the new department store was to have direct access from a parking lot fronting Trinity Street. The second story of the building has a 75-foot frontage with entrances on Spring Street. A third floor was used for storage. The Town of Newton acquired three lots along Trinity Street, demolishing houses at 22, 24 and 26 Trinity Street, to provide parking.